Orange Naturals Bites + Stings for Kids gives quick relief from the pain and itching of pesky insects and lets your kids get back to enjoying the out-of-doors. 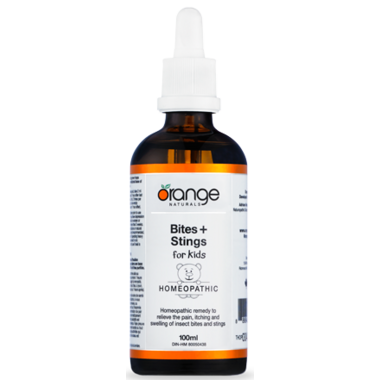 Orange Naturals Bites + Stings for Kids is used to relieve the pain, itching and swelling of insect bites and stings. Directions: For general dosing, ages 0-11 years: take 0.5 ml, 3 times per day; age 12 years and up: take 1 ml, 3 times per day. For acute symptoms, ages 0-11 years: take 0.5 ml every 30-60 minutes (up to 12 times per day); age 12 years and up: take 1 ml every 30-60 minutes (up to 12 times per day). When symptoms improve, resume general dosing.Take under the tongue or in a little water. Shake well before each use. Refrigerate after opening. Warnings: Consult a healthcare practitioner prior to use if you are pregnant or breastfeeding, and during use if symptoms persist or worsen, or if new symptoms develop. Do not use if seal is broken. Keep out of reach of children.